You must compete against the other hopefuls, all working in the same confined area to produce recipes of varying complexity. Only one of you will earn the respect of your teacher, and the revered title of Itamae-San! 72 Ingredient Tiles such as Salmon, Avocado, Maki, etc. A large grid which is the playing surface. You will use a specific zone of the board depending on how many players are in the game. With 2 players use only the lightest 5 columns. With 3 players add the next darker column. With 4 players use all 7 columns. The green dots on the board are a reminder of which area you should use. Each Token length-side displays a Recipe length, a point value, and how many Wasabi Cubes you earn for completing the sushi with style. (explained later) Each Token point-side shows only the point value. The object of Wasabi! is to prepare sushi by laying ingredients onto the board, earning points by matching your recipes, meeting your challenges-and trying to do it all with style! Success will earn you your choice of useful Action Cards. 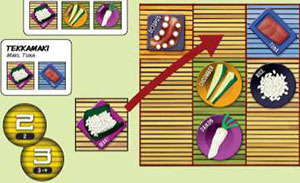 When the board fills up, the player with the most points wins-but an extremely skilled chef could achieve an early instant victory by completing ten challenges before the board fills up. Balancing speed with technique will be crucial if you plan to win the contest! 1 Place the Board in the center of the table. 2 Sort the Ingredients by type and stack them in the appropriate area of the Pantry. There are six different categories of Ingredients, identified by background color. 3 Separate the Recipe strips by length, and place them face-down in shuffled stacks near the board. 4 Place the Action Cards face-up in the Kitchen. (Their arrangement within the Kitchen is not important). 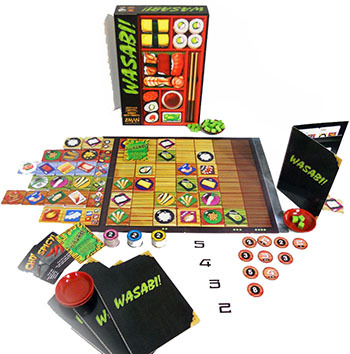 For a 3-player game use these 7 Action Cards: 2 Wasabi!, 2 Spicy!, 1 Chop!, 1 Switch!, and 1 Stack! 5 Gather all of the Wasabi Cubes into a supply near the board. 6 Give each player a Screen, a Bowl, and all 10 Challenge Tokens of one color. Any remaining Token sets, Bowls, or Screens are not used. Set up your Challenge Tokens on the table in front of you length-side up so that everyone can easily see them. Stand up your Screen so that you can conceal items behind it. Heeding the Rules For Starting Hands (see the explanation to the right), take 3 Ingredient tiles from the Pantry and pass them to the player on your left. This is their starting hand. Players may hide their hand behind their Screen. Proceeding clockwise, each player does the same until everyone has a starting hand. Take 3 Recipes (of whatever lengths you wish), and slip them into the slots in your Screen. You may look at each Recipe as you draw it before drawing the next. Proceeding clockwise, each player does the same until everyone has their three Recipes. When everyone is ready the game begins. Step 1: You MUST play an Ingredient tile, and you MAY play an Action Card. You may choose to Pass instead. Skip Step 1 entirely, and discard some or all of the Recipes from your Screen. Discarded Recipes go to the bottom of the stack they originally came from. Then continue with Step 2. Step 2: Prepare for your next turn. You must lay exactly one Ingredient tile from your hand onto any unoccupied square of the board. (Make sure to stay within the play area as dictated by the number of players). You may play an Action Card during Step 1. (Maximum 1 per turn. Depending on the Action Card itself, you might play it either before or after you lay your Ingredient tile). See the Action Cards section for details on all 5 different Action Cards. If, on your turn, you create an uninterrupted straight-line vertical or horizontal Ingredient sequence on the board that matches one of your Recipes, you have completed a Recipe. (The sequence can include tiles previously placed by any player, so long as you are responsible for the tile that completes the sequence. Tiles adjacent to the sequence in all directions are irrelevant). You may only complete a Recipe of a given length if you have an unassigned Challenge Token of that length. The sequence of Ingredients does not have to be in the exact same order as that shown on the Recipe strip. If it is in the exact same order, you have completed the Recipe with style, which will award you bonus points for Recipes of a length greater than 2. Recipes will usually be completed by laying down Ingredients, but some effects of Action Cards can result in completed Recipes as well. (See the Action Cards section for those instances). It is possible to complete more than one Recipe on a single turn, through clever tile placement and Action Card use. After completing a Recipe, remove the Recipe strip from your Screen and lay it face-up in front of you where everyone can see it. Assign a Challenge Token (of the correct length) to the completed Recipe by placing it on top of the Recipe strip with the point-side up. If you completed the Recipe with style, take the indicated number of Wasabi Cubes from the supply and put them in your Bowl. Reminder: If you do not have an unassigned Challenge Token of the correct length, you may not complete a Recipe of that length. Once you have completed a recipe and assigned a Challenge Token to it, it can never be taken away from you, even if the layout of the board changes. Recipe Completion Example: You have completed the Pickle Barrel Recipe. Remove the strip from your screen and place it in front of you. Since it is a 3-part Recipe, take one of your unassigned 3-length Challenge Tokens and assign it to the completed Recipe by placing it point-side up on the Recipe strip. The point values of such assigned Challenge Tokens will go towards your final score when the game ends. If you had completed the Pickle Barrel with style (that is, in the exact same order as shown on the strip), you would take the number of bonus Wasabi Cubes indicated on the length-side of the Challenge Token, which in this case is 1 cube. Completing Example: You have the Crunchy Tuna Recipe in your Screen, an unassigned 3-length Challenge Token, and a Tempura Ingredient in your hand. 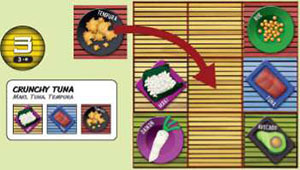 You place the Tempura on the empty square between the Maki and Tuna that are already on the board, creating a straight-line sequence that matches the Crunchy Tuna Recipe. Even though they are not in the exact same order as on the strip, you have completed a Recipe! Multiple Completing Example: You have the Pickle Barrel and Tekkamaki Recipes, unassigned 2-length and 3-length Challenge Tokens, and a Maki Ingredient in your hand. You place the Maki on the square indicated. This allows you to complete both of those Recipes! 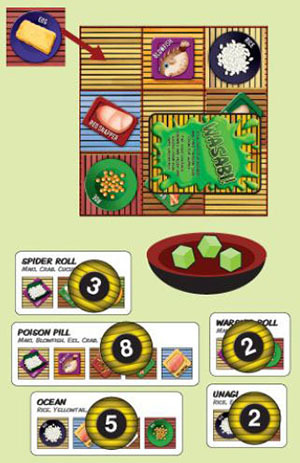 In addition, since the 3-part Pickle Barrel sequence matches the strip exactly, you will earn a Wasabi Cube for completing that Recipe with style! Action Cards-Collect 1 Action Card as a reward for every Recipe that you completed on this turn. You may select Action cards from the Kitchen, and/or pick up any Wasabi! Cards that are on the board. You may not select an Action Card of the same type that you played on this turn, unless there is no other option. You may never have more than 2 Action Cards in your hand. (You can discard Action Cards into the Kitchen at any time if you want to make room in your hand for a newly-earned one). You may conceal your Action Cards behind your Screen if you wish. Ingredient Tiles-If you have fewer than 3 Ingredients in your hand, you must draw fresh Ingredients from the Pantry (whichever Ingredients you want) until you have 3. Recipes-If you have fewer than 3 Recipes in your Screen, you must draw new recipes (of whatever lengths you wish) from the stacks and add them to your Screen. If you are drawing more than one, you may look at each drawn strip before drawing the next. Your turn is now over and play continues with the next player to your left. Instant Win! If one player assigns all 10 of their Challenge Tokens to recipes that they have completed, the game ends immediately and that player is the winner, regardless of how many points everyone has earned! 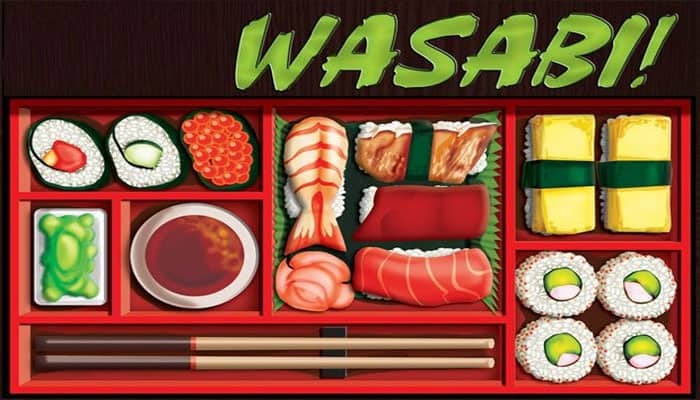 If, at the end of a player's turn, all squares on the board are filled, either with an Ingredient or part of a Wasabi! Card, the game ends immediately. All players count up their points (assigned Challenge Token points plus 1 point for each Wasabi Cube), and the player with the most points wins! In the event of a tie for most points, the winner is the tied player with the most Wasabi Cubes. If the result is still a tie, the game ends in a draw. There is only one empty square left on the board. (All of the rest contain Ingredients or are covered by part of a Wasabi! Card). On your turn, you play an Egg tile into the final square, which fills up the board. At the end of your turn, (the very end-remember to perform Step 2) the game ends immediately. All players add up their points. Having completed the five recipes shown, (worth 8+3+5+2+2), and with 3 Wasabi Cubes in your Bowl, your final score is 23. Note: If you had completed a Recipe by placing the Egg, and if you had chosen to pull the Wasabi! Card off the board as your reward during Step 2, the board would not have been full at the end of your turn, and so the game would not have ended just yet.